Clear all jelly and reach 70000 points to complete the level. 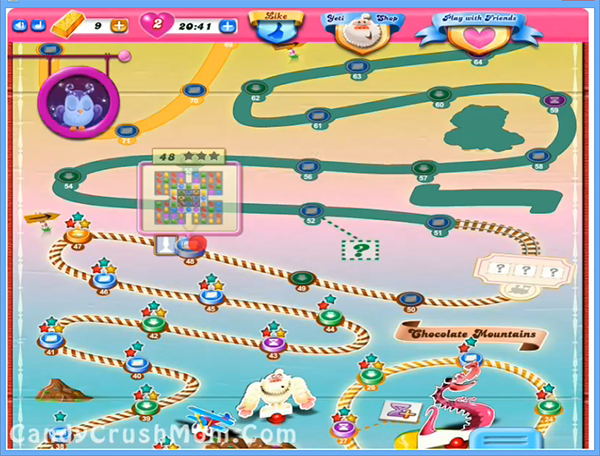 This level have same requirement as some previous level and you have to break jellies with 9 grill boxes in middle of the candy board. First you should try to break candies of grill boxes or near to it or break candies in bottom of the board. As candy board start to get less grill boxes you will have more chances to make special candies and then you can make more special moves near to jellies. Some special moves you can make is that you can see in a walkthrough video is combine striped candy that you can get by combining four same color candies with wrapped candy that you can get by making ‘L’ or ‘T’ shape. We completed this level with 87060 score by focusing more on special moves and candies and at end of the level remaining moves converted to fish booster that help to add more points on score board.